I would recommend this hotel to friends. The price I ended up paying was wonderful for the room. The location and the room space was very nice. Although, the overall experienced was good. The hotel desk clerk made a mistake and charges me again for the room which was already paid. I didn't find out until days later when I check my bank account. Not very happy. Although, this hotel was a non smoking facility there were people right outside the doors smoking. Overall the hotel itself was very nice. Upon entering you felt comfortable with the fireplace and French doors leading to the pool. The issue we had been with our room. Our room had a musty odor with humidity. Almost as if there was a leak in the vicinity. Unfortunately, we failed to mention this to the staff. But upon further thought I will call and let them know. Lobby was inviting with the fire going in the am. Continental food was just ok; our room had a musty odor. The pet-friendly Residence Inn San Diego Downtown is an upscale extended stay all-suite, apartment style hotel in the heart of the downtown area on the Pacific Coast Highway. The four-story, non-smoking property comprises 121 suites equally suited to the business or leisure traveler. Items included with the room rate are a hot breakfast buffet, a managers reception on midweek evenings, high-speed Internet access, local telephone calls and coffee available in the lobby 24/7. There is one meeting room available for social or business functions that can accommodate 30 guests. 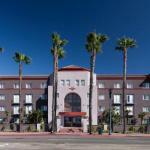 The property overlooks San Diego Bay and is near the citys famed Gaslamp Quarter. It is an easy drive to area attractions including La Jolla, Mission Valley, Coronado Island, the San Diego Zoo, Balboa Park, the San Diego Wild Animal Park, Sea World Adventure Park, Legoland and the beaches of San Diego. All the suites have a fully equipped kitchen with a conventional and microwave oven, stovetop, refrigerator with icemaker, dishwasher, coffeemaker, toaster and a full set of cutlery and crockery. There is a work desk with high-speed Internet access, two-line telephone with voicemail and speakerphone, pullout sofa bed, television with cable movie and news channels and pay-per-view movies, hairdryer, and iron and ironing board. This inn has an outdoor heated swimming pool, whirlpool and a fitness center. The hotel offers a grocery shopping service and can arrange for local restaurants to deliver. Nearby restaurants include the Cabo Café, the China Camp, Fat City Steakhouse and the Indigo Grill. The 24-hour front desk has safe deposit boxes. Other amenities include a concierge desk, coin-operated laundry, copy and fax services, vending machines and a picnic area with a barbecue grill. Visitors to San Diego loved this Residence Inn. It was close to all the downtown attractions and the inn operates a free shuttle within a three-mile radius. The employees were efficient and friendly and gave good advice about where to go and what to see. Some travelers had a problem with train noise while other never noticed it. Most customers say they will recommend this property to others and planned to stay here the next time they come to town. Parking: Yes, there is parking. It cost is $12 per day. Pets: Yes, pets are allowed. There is a $75 charge.